Hard rockers Scorpions are promising to rock fans like a hurricane at this year’s Rocklahoma music and camping festival. Set for May 27-29 at the Catch the Fever Festival Grounds on U.S. 69 in Pryor, Okla., near Tulsa, the all-ages, 10th annual event also will feature sets by Megadeth, Thousand Foot Krutch, Rob Zombie, Texas Hippie Coalition, Sixx A.M., Five Finger Death Punch, Three Doors Down, Collective Soul and Disturbed, among others. Those still missing the voice and work of the late Ronnie James Dio (Dio, Rainbow, Black Sabbath) should fine some comfort in The Last in Line, a group that features ex-Dio band members Vivian Campbell (guitar), Jimmy Bain (bass) and Vinny Appice (drums). Scorpions’ evening appearance — Scorpions’ set time and the other bands’ time slots will be announced later at rocklahoma.com; the festival’s lineup schedule is still being determined — will be part of the quintet’s 50th Anniversary Tour and will be a rarity for Oklahoma fans. Hailed as the “Heroes of Heavy Metal” by Rolling Stone magazine and the “Ambassadors of Rock” by MTV, Scorpions have rarely played the Oklahoma region, according to the band. The German hit-makers formed in 1965 in Hanover around guitarist Rudolf Schenker. Schenker performed in Scorpions’ most popular lineup, from 1978 to 1992, a lineup that included singer Klaus Meine, guitarist Matthias Jabs, bassist Francis Buchholz and drummer Herman Rarebell. The aggressive-sounding group gained many fans with such well-received albums like “Animal Magnetism” and 1982’s “Blackout,” but it was the 1984 long-player “Love at First Sting” that hurled the band into the world-wide spotlight. The latter LP’s hit songs “Rock You Like A Hurricane,” “Still Loving You” and “Big City Nights” received heavy rotation on radio and in music-video form on MTV. Scorpions entered the 1990s with much of their popularity intact, with the popular single “Winds of Change” and a cover of The Who’s “I Can’t Explain” pleasing many of the band’s faithful listeners. 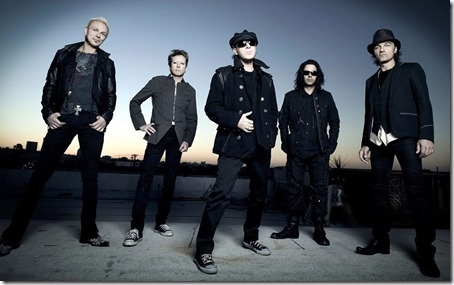 In 1994, Scorpions were the recipient of the World Music Award before winning the Echo Lifetime Achievement Award and the Rock Legend Award in 2009 and 2010, respectively. The Hard Rock Cafe chain bestowed Lifetime Achievement Awards on the group. Today, Scorpions include Schenker, Meine and Jabs alongside drummer James Kottak and bass player Pawel Maciwoda. Other groups set to play at Rocklahoma include Chevelle, Bullet for My Valentine, Steel Panther, Sebastian Bach, Sevendust, Pop Evil, P.O.D., Great White and The Sword. Weedend passes, camping passes, tickets and information can be obtained by calling (866) 310-2299, by emailing info@rocklahoma.com and visiting rocklahoma.com.